Ok, let's be totally honest. This is not a board game. It really fits into the category of a roleplaying game. But, much like Fiasco, Conspire does not fit into the traditional roleplaying game format. It's not intended for long-form stories that take multiple sessions to complete. There's no GM, no character sheets, it doesn't even use any dice. 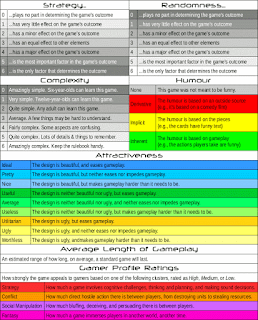 But although it technically is a roleplaying game, in that players create a role and play the part of that role in free-form storytelling, it is much better suited to the sort of settings in which one would be likely to play a board game. Besides, I enjoyed the heck out of this game, and I really wanted to write a review for it. So I'm going to. Players become part of a grand conspiracy (or, if they like, a not-so-grand conspiracy), as they take on the role of powerful individuals struggling to influence the outcome of a momentous point in time. They wield their power to affect the future, which hinges on their actions. The very balance of the world rests on their weary shoulders. How will the conflict be resolved? Will the Probots manage to protect the rights of artificial intelligence, or will the Robophobes prevent the incursion of synthetic life forms into their inherent realm of superiority? Ok, obviously, this game is not at all a serious one. The stories that you will tell with Conspire are as far-fetched, ridiculous, and hilarious as you and your friends are capable of imagining. But that's what makes the game so wonderful. 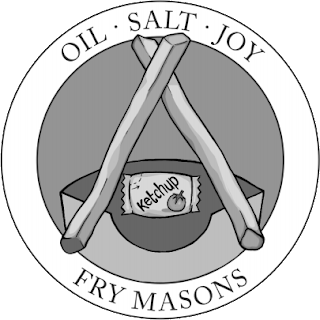 Telling outlandish stories about the machinations of the elite members of the Fry Masons (no, that's not a typo) to see who will become the next Fry Master is just about as enjoyable a way to spend an evening as I can imagine. Artwork by Jake Breish, from the rulebook. 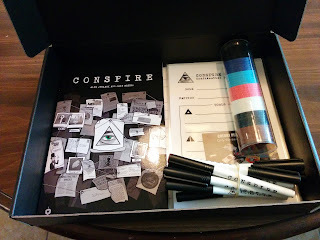 Conspire takes place over three phases: Genesis, Exodus, and Revelation. In Genesis, players craft a moment in time, deciding what the important conflict is, and who is involved in it. Everyone is encouraged to offer input, and everyone's suggestions should be incorporated into the setting if possible. The first time I played, one player said that she wanted it to involve dinosaurs. The next player said, 'Dinosaurs with lasers!' The next added onto that, saying 'Dinosaurs in the future!' which inspired another player to specify, 'Dinosaurs in space!' As a result of this collaborative brainstorm, we set our conflict aboard a spacecraft carrying a crew of dinosaurs, all of whom had head-mounted laser cannons implanted at birth, on a mission to find the planet where the last surviving gnomes were living, and eradicate the gnome menace. As part of this setup, we decided that there was a strict hierarchy amongst the dinosaurs; the carnivores were the privileged elite, and the herbivores were second-class citizens. But there were also, as a result of genetic experimentation, some omnivorous dinosaurs who belonged to the untouchable lower caste. Once the setting is created, players create roles. There's one for each player, and these should be archetypes (such as 'Venture Capitalist' or 'Hipster Rabblerouser'). If the conflict involves factions, each role should be clearly described as belonging to a particular faction (some settings, like our laser-dinosaurs-in-space setup, may involve factions; in this case, there were those who wanted to complete the mission as detailed, whereas others were in favour of preserving at least a small breeding stock of gnomes. 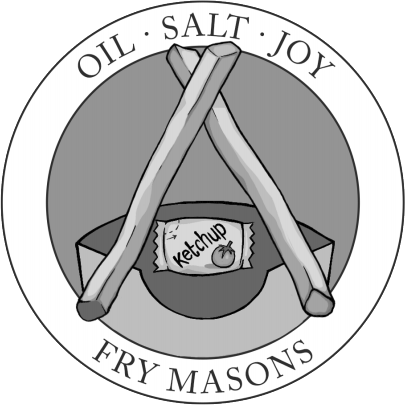 Other settings, like the next-leader-of-the-fry-masons setting, may not have factions). The roles from our dinosaurs game included a Carni Captain, an Herbi Zealot, an Omni Rebel Leader, an Herbi Scientist, and a Carni Cook. The roles are then shuffled together and passed out at random to the players, who then create goals for their role. These should preferably have something to do with conflict at hand. A few examples from our dinosaurs-in-space game included: cause the captain to lose command; help the carni cook; cause the Herbi Zealot to lose followers. Once these goals have been written on the role sheets, they are shuffled again and passed out to the players once more. The players look at their assigned roles and decide how to proceed with their story. Then we move on to Exodus. This is where the fun happens. Players take on the roles they have been dealt and move the story forward as they manoeuvre the conflict being played out. As they do this, they are also trying to accomplish their goals. Keep in mind that the goals are more important for 'winning' the game than the conflict itself is. Regardless of how the conflict is resolved, you get points only for the goals that you achieve. As such, you want to keep your goals secret as you engage in sneaky manipulations, shady alliances, and secret back-room dealings to fulfill the requirements on your role sheet. You do have one important tool that allows you to manipulate reality to your benefit: Influence Tokens. Each player has three, and these may be spent at any time to declare something about the world to be true. There are some minor restrictions on the use of Influence Tokens, such as not being allowed to use them to undo something that was created with the use of an Influence Token, but these items are very powerful indeed. Gnomes are the tastiest and healthiest dinosaur food in existence. Gnome bones are an important ingredient in powering our spacecraft (the phrase 'bacon-wrapped rocket fuel' was used repeatedly throughout the session). The mission was originally supposed to take fifty years, but due to an error on the part of the helmsman, it ended up taking five thousand years, and the crew was required to spend a large portion of that time in cryostasis. Dinosaurs were once enslaved by gnomes, and at least part of the motivation for the gnome-icidal mission was a desire for vengeance by the dinosaurs. God-a-saurus had been empirically proven to exist. As the conflict draws to a close and a resolution becomes apparent, one player is chosen to detail the end of the story as an epilogue. Then we move on to Revelation. At this time, players reveal the goals they had on their role sheets. Everyone works together to decide if a player's goals were accomplished or not. Each player gets a point for every goal that they achieved. They then decide if they want to play another round, and if so, whether they want to tell a continuation of the story they just finished, a completely new story, or perhaps even to create some new roles and replay the same conflict with new perspectives. After our dinosaurs-with-head-lasers session ended (with just enough gnomes being taken prisoner to feed the crew and fuel the ship on its voyage home), we chose to play a new round with a new setting. We opted for a more low-key session in round two: we were construction workers on a planet assembled from chunks of different worlds resulting from a rift in space-time, trying to decide if we were going to have the retirement party for one of the crew at the annoying boss's house or at the home of the fun co-worker. There was the new guy: a naive elf, the annoying boss: a samurai, the OSHA director: a cybercop, the guy retiring in two days: an old-west cowboy, and the fun coworker: a modern American person. After that, we might have played a third round, but the cafe was closing, so we were obligated to go home. Oh my goodness, we all had so much fun with this game. We didn't really even care about the points we got for our goals, we were just having a great time telling incredibly outlandish stories. If you've been reading this blog for a while, you probably know that I got this game as a reward for backing it on Kickstarter. I am so glad I did; I haven't had that much fun with a storytelling game in a very long time. 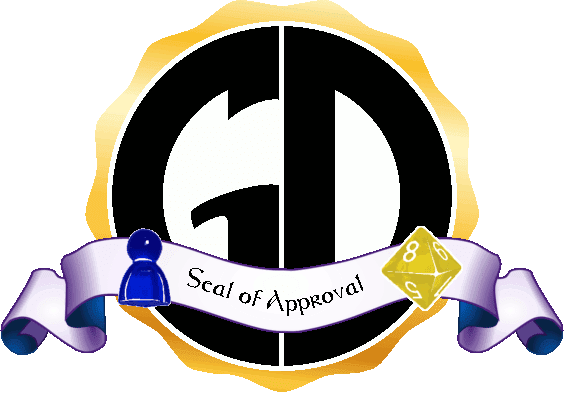 In fact, I enjoyed this game so much, I awarded it the Game Dork Seal of Approval. I'm sure there are some people out there who wouldn't do well in games of this nature. But I sincerely believe that, with the right guidance and support, anyone would be able to at least have a passing chance at telling hilariously outrageous stories with this game. So that's it for this review. 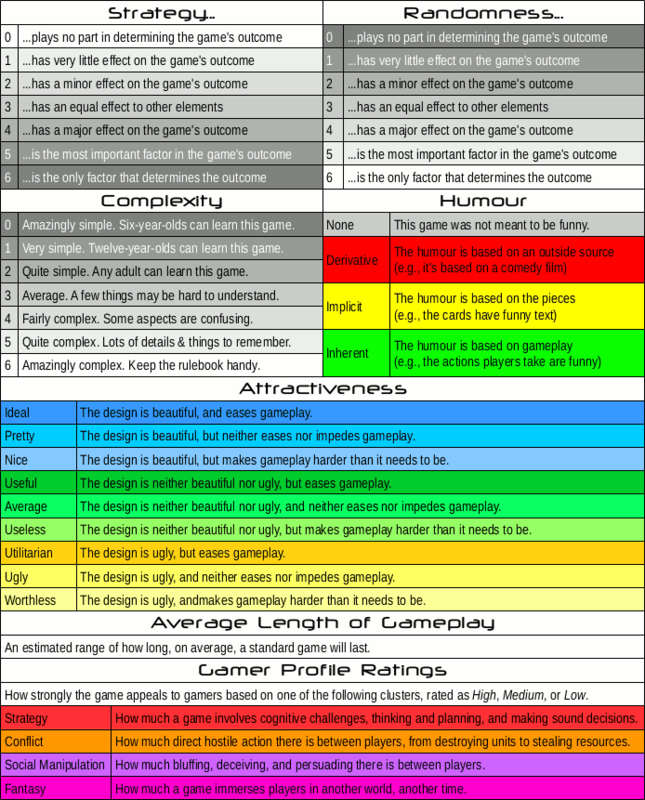 I don't often recommend games this highly; as you probably know, I try to describe a game objectively and let you decide for yourself whether to give it a try. But in this case, I really think it deserves a chance. Seriously. Buy a copy (it's on Amazon and other games retail sites, or you can buy it directly from the publisher at https://www.cherrypickedgames.com/, and have fun with this amazing game.